...it's always tea-time...: INVENTION AND DISCOVERY. POLO STICK.—Our boys should be interested in this invention, as it suggests many ideas for the improvement of other sporting goods. While the inventor has called his idea a polo stick, it is in fact in the glove that the novelty lies. This is made of strong leather, and in the palm a metal plate or lock is fixed. The glove fastens at the wrist with a strong button. The polo stick, instead of being grasped around the stock, is held by a metal handle, in the centre of which is a hasp fitting the lock in the palm of the glove. 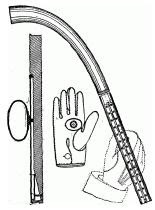 The polo stick is thus firmly locked to the hand and practically becomes a part of the user's arm. So strong is the lock that the stick must be splintered before it will give way. For polo such a device is invaluable, for dropping one's stick means dismounting and losing much valuable time; but a simple locking device would be of great assistance in all games that require the stick, bat, or club to be held with especial firmness. SPRING CASTER.—This is a very novel idea, and one which is likely to become very popular if it is found to be practical. Between the roller of the caster and the plate which attaches it to the chair-leg, a strong spiral spring is inserted. The chair thus supported adapts itself to every movement of the sitter, and gives ease and comfort that no firmly fixed seat can do. For writers these springs are particularly delightful, as the forward movement of the body brings the seat forward with it, and the writer can have the comfort of resting his back at the same time that he is at a convenient angle for his work.